One Super Cube and one Unit Cube are left. Now that they have played a while, Lion has one Super Cube and one Long on his board. Let's see if he wins. The materials for the game are listed with the for playing it in Two Land. 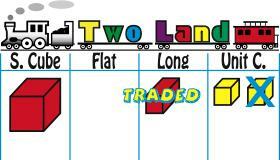 Play the Fair Trades DOWN penny game in Two Land and Three Land with the Fair Lands blocks. Then play it in at least one other land with counters. If are available, play it in Ten Land, too, but just a little because the bigger the land, the less practice on trading. In playing the game, stress keeping trades “simple”: always trading the smallest and fewest blocks possible. 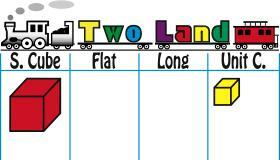 This ensures working right-to-left and column-by-column like in subtracting. Unlike in the trading up game, keeping one’s activity board safe is not an issue. In trading down to have enough Unit Cubes to satisfy a coin toss, the board is made safe the moment the required number of Unit Cubes are removed from it. Imagine a Fair Trades DOWN penny game in Two Land between Lion and Tiger. 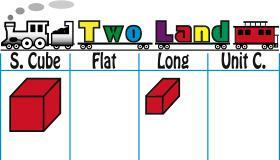 When they started, each of them had one of each block on their activity board as shown below. It is Lion’s turn and he tosses a head, so he has to take one Unit Cube off his board, but there isn’t one. 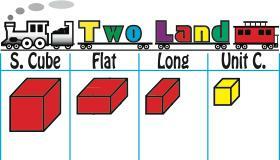 So he trades the Long for two Unit Cubes. Then he takes one Unit Cube off his board. It is Lion’s turn again and he tosses a tail, so he has to take two Unit Cubes off his board. Since there is only one, he trades the Super Cube for two Flats. Then he trades one of the Flats for two Longs. Then he trades one of the Longs for two Unit Cubes. Finally, he takes two Unit Cubes off his board.